Hi I'm Talaria, a HS player from Portugal. I just wanted to share the list I've hit legend with this season (March), in just 120 games, a Dragon Warrior deck. Follow me on TWITTER for stats, decklists and more. And follow me on TWITCH for streams (starting next week). I hit legend (only my second time) with this deck. Here are my stats. V3.0 (and 3.1 was the climb to rank 5 in the first week of the season). Other versions were when I came back to the deck to make the final climb (rank 4 to legend). I swapped out rag because I was hitting >50% warrior and aggro shaman so I felt I needed an ooze. Eventually, reno lock came back in force, so I put Rag back. Thanks again for the deck. The card stats are so interesting :P its very in line with what I consider to be the best cards in the deck. I'm glad it worked for you, and truthfully its not that good rn because of reno locks. I myself am switching between reno lock and reno mage at top 100 rn. 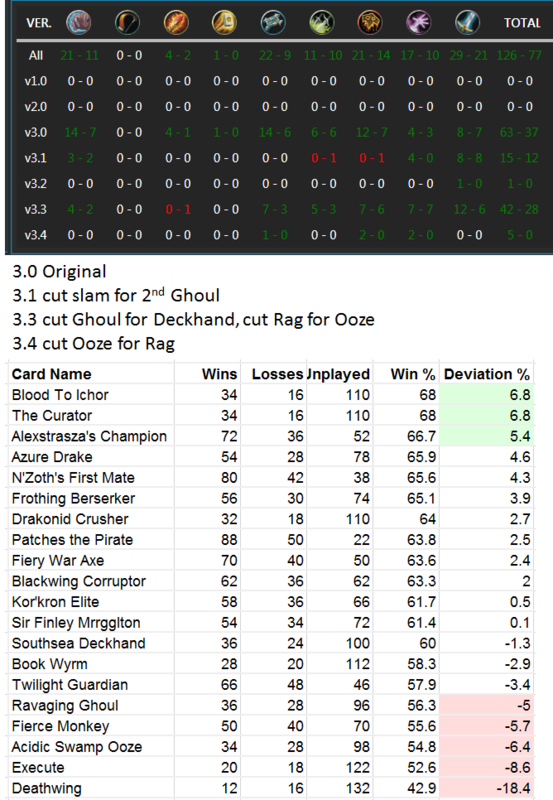 Your stats also reveal that slam may be better than deckhand after all, which is a conclusion I'm also inclined to take from my last sessions with the deck. Looks like you did it in about 200 games which is pretty good, even more so considering meta changed from the first days. This Deck is Amazing! It absolutely crushes Shaman/Druid/Mage and ist also very good vs Pirate Warrior and Priest!. Made it to Legend with this exact List! First match is versus pirate warrior which was kinda hard and I think I got a bit lucky. Not sure if I should have play / keep the finley cuz the fact it is a face warrior and I need the extra health by armor up. Great deck, hit legend with it. Only thing i don't have Rag so replaced it with Grom, works fine too. First time Legend with this deck, thank you! It's a really nice deck!! i dont have Patches the Pirate, so im using another Execute! vs Paladin, some miss play but thats ok! any replacements for Patches the Pirate? First time legend with this deck, thanks man! Deathwing is the real MVP. That's amazing! Thanks for the support! Thats an incredible feat! Thanks for the support I appreciate it.